Vulnerability Scanner: Most attackers try to attack into old code of programs that are vulnerable. McAfee’s vulnerability scanner makes sure that you don’t keep outdated software on your computer and notifies you whenever an update to any program you have installed on your machine is available. McAfee QuickClean: McAfee QuickClean is a great technology that removes cookies(that track you) and deletes all the temporary files which unnecessarily eat space on your computer and slow it down. McAfee Shredder: Deleted files are still recoverable, even after you delete them from the recycle bin. McAfee Shredder makes sure that any file it deletes, can never gets recovered. This can be used to delete sensitive files like company databases. Protects Wi-Fi Connections: McAfee Antivirus Plus 2015 tracks both, incoming and outgoing connections to and from your computer, and stops any malicious activity as soon as it identifies it. Optimised Scan Engines: McAfee Antivirus Plus 2015 comes with new and improved scanning engines. They make sure that your system gives better performance and doesn’t slows it down. McAfee Antivirus Plus 2015 also has improved start-up performance and it won’t slow down your PC while the windows load. You need to have Windows Vista SP1 or newer version of Windows OS to install McAfee Antivirus Plus 2015. Required RAM is 1 GB for Windows Vista and Windows 7, and 2 GB for Windows 8 and above. 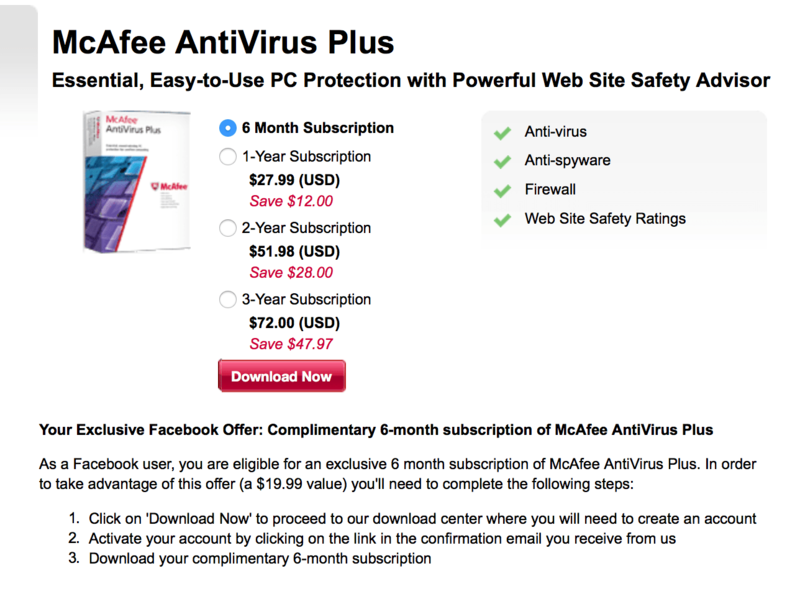 The license you get in this giveaway is a six months free license to use McAfee Antivirus Plus 2015 on a single computer for home/personal use. The license key includes free updates to the product and free virus definition updates for a six months period. You don’t get any technical help with the free license. The offer can end anytime without any prior notice. To make sure you reap the benefits of the offer, enrol for the offer, download, install and register your McAfee Antivirus Plus 2015 before the offer ends. The six months trial licence in the giveaway, is an extended free license. This is not at all different from a real license in respect to features or security.